Compass Marine Boat Fender Covers are extremely hard wearing. 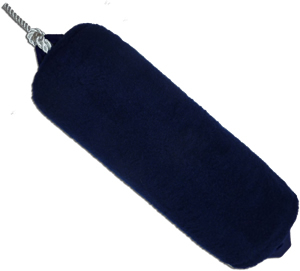 Made from a machine washable, fibre pile material with a drawstring closure at both ends they are made to fit the fenders snugly and keep your boat free from damage from dirty fenders and your sleep uninterrupted by squeaky fenders! Other stretchy fender covers are prone to laddering or splitting when they start to wear, meaning that the smallest hole can render them unusable. With our covers the smallest hole remains just that and does not compromise the effectiveness of the whole cover! To request a sample of the fender cover material please click here. Fits Majoni Star 25 fender.